An 80-year-old woman in Lynn, Mass., faces charges after she fed the birds at her local pond. Town officials have filed criminal charges against Claire Butcher after she repeatedly violated a local ordinance that prohibits feeding the birds. But Butcher couldn't seem to stay away from her winged friends and has been charged with violating a 2009 No Tresspass Order that prohibited her from visiting local parks. In the years since the order went into effect, police said they continued to receive complaints about Butcher, who allegedly took entire shopping carts filled with food to feed the feathered creatures. Butcher, however, insisted she merely wanted to save six domesticated ducks from starving and wasn't feeding hordes of wild birds. "Being an animal lover, I couldn't leave any animals to starve to death," Butcher told ABCNews.com. Officials for the city of Lynn, however, are fed up with what they said was a pattern for Butcher and pressed charges against the octogenarian that could result in jail time. "Well, look at it this way," Butcher said, laughing. 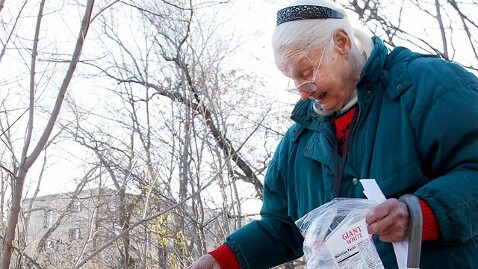 "I will be the first 80-year-old woman in the world who was thrown in jail for feeding the animals." Christopher Kelly of the Lynn Police Department said Butcher had plenty of opportunities to stop before she was charged with violating the No Tresspass Order. "It's been an ongoing issue," Kelly told ABCNews.com. "She's been warned before." Kelly said that the health department had become concerned about community health and safety because of the increase in bird feces in the park that it linked to Butcher's actions. Butcher, however, sees it differently. "I have been feeding [the animals] since 1966. I'm 80 years old, and I have no health problems," said Butcher. "To me, that's just a lousy excuse." In spite of her age and the charges, Butcher remains defiant. While she said a local animal shelter took in three of the domesticated ducks, she said that with winter coming she might be tempted to feed the animals again "in a moment of weakness. "The animals at the pond do not belong to the city of Lynn. They belong to God," said Butcher. "If they have an issue, they should take it up with God."